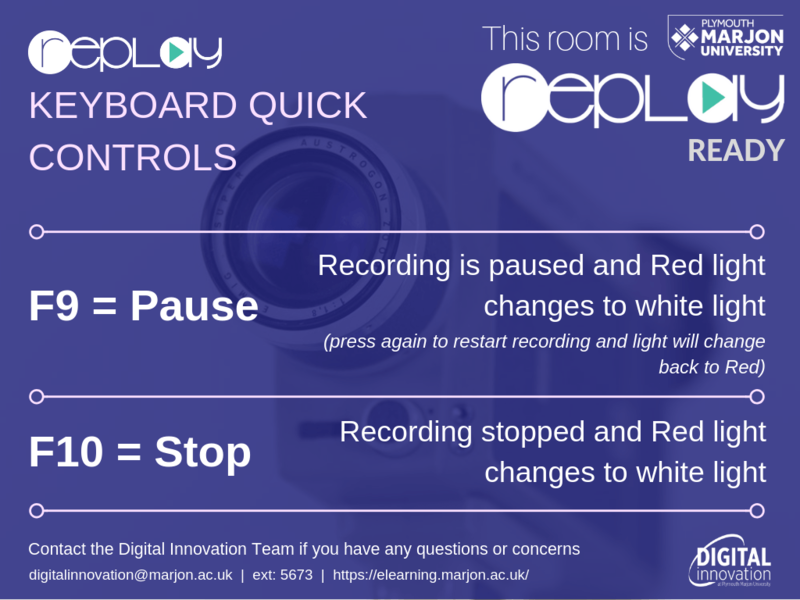 Replay automatically captures scheduled content including Lectures, Practicals, Seminars and Workshops in teaching spaces equipped with automatic recording equipment. After a session is captured there is a 48 hour delay before the capture is published on any LearningSpace page. Please note that for Module Leaders/Tutors the session will appear on the module page straightaway, but students will not see this until after the 48 hour delay. Please note that if a laptop has been fully shutdown and you begin your session, it will take time before the system loads and this can cause a delay before the REPLAY system starts recording. The advice we give is to never shutdown a computer in any teaching room, but to log off as courtesy to other teaching staff. During a session staff members have the ability to control the recording using the In Session controls. F9 on your keyboard will PAUSE a recording, the light will show WHITE. F9 will also RESTART a recording if it has been paused, the light will go back to RED. F10 will STOP the current recording, the light will go WHITE. If you are in a session and there isn’t an automatic recording taking place you can start one by right clicking on the Panopto icon in the system tray or by starting an ad-hoc recording using the desktop recorder. If you start a recording in the session from the system tray please get in touch with the team afterwards so we can ensure it gets put into the correct module folder.